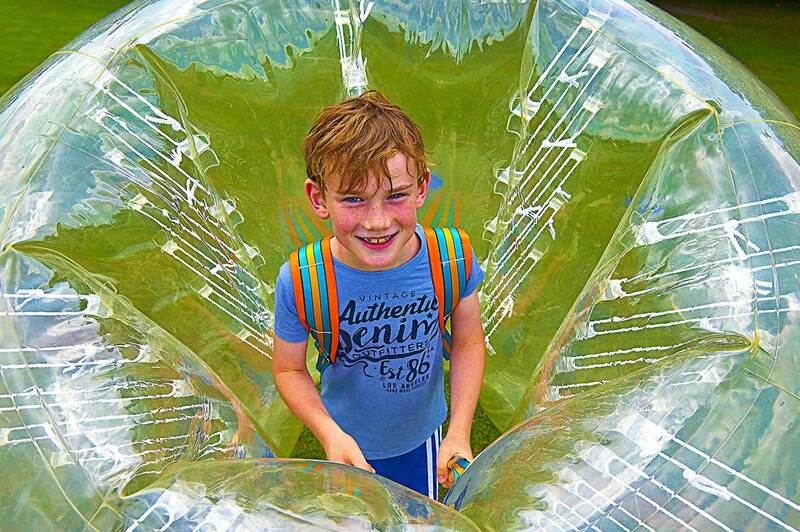 Body Zorbing is the one of the latest crazes to hit the UK! We can run Body Zorbs sessions for a range of age groups; from children aged 8 years old right up to adults. With Body Zorbs your legs are free, so you can run around and play a variety of games. Our favourites include Zorb football, gladiator game and relay roly-poly races. We provide all the equipment you’ll need, including our own fully trained and insured staff. £240 for a 2 hour session including 4 Zorbs and 1 fully qualified member of staff. Please ensure you wear closed toe shoes, i.e. trainers/plimsolls (flip flops, sandals, or crocs are not suitable). Active wear is also recommended, such as shorts/tracksuit bottoms, and a jumper incase the weather gets a bit chilly. Body Zorbing is very safe, as long as the instructions given by our instructors are followed. There are obviously risks involved when using zorbs, however full risk assessments have been carried out for all our activities to ensure they are run safely. If you require any specific information about our risk assessments or operating procedures, please do get in touch. If you would like to book a Zorb session, please fill out the form below and one of our team will get back to you to discuss your enquiry.